In March 2014 Vladivostok began her sea trials sailing out of the Atlantic port of Saint Nazaire. 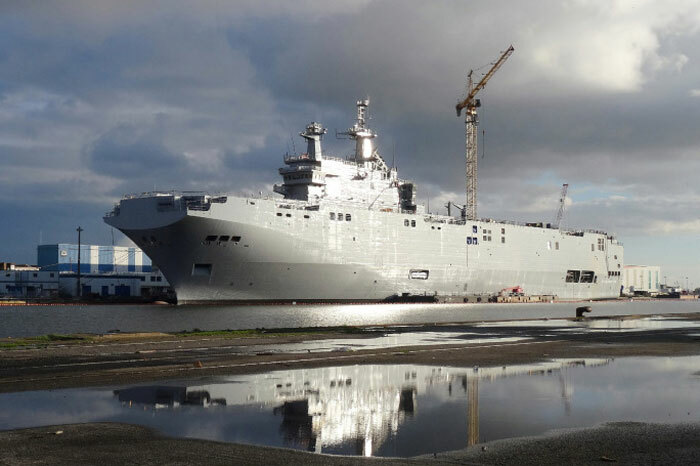 A French-built helicopter carrier Vladivostok has set sail from the French Atlantic port of Saint-Nazaire on its first sea trial. The warship is part of a 1.2-billion-euro deal ($1.6-billion) that marked the biggest-ever sale of NATO weaponry to Moscow. On March 5, 2014 Vladivostok began her sea trials sailing out of the Atlantic port of St. Nazaire. 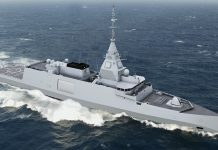 The Vladivostok is on track to be delivered by the last quarter of this year, said spokesman Emmanuel Gaudez of DCNS, a state-backed naval shipbuilder manufacturing the warships along with South Korean-controlled shipbuilder STX. A sister ship, the Sevastopol is scheduled to be delivered about a year later. 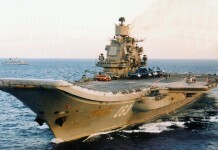 The two carriers will be delivered to the Russian Pacific Fleet in 2015 and 2016. 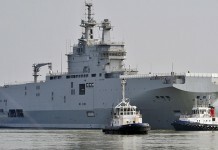 Under the contract, France shall build each Mistral ship within 36 months. The first of them, the Vladivostok, is to arrive in St. Petersburg from Saint-Nazaire, France, in December 2014. 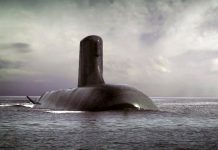 The vessel will receive its additional Russian systems at the Severnaya Verf shipyard in St. Petersburg, and then be handed over to Russia’s Pacific Fleet in November 2014. The Vladivostok will carry eight Ka-52K attack helicopters and eight Ka-29 anti-submarine/multi-mission helicopters. 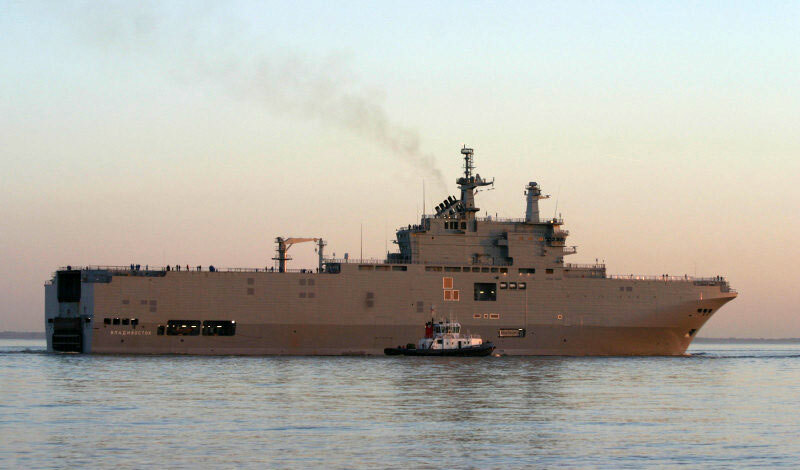 The Mistral-class assault landing ship has a displacement of 21,000 tons; its overall length is 210 meters. The vessel can operate on missions at ranges of up to 20,000 miles sailing at a speed of over 18 knots. It is operated by a crew of 160 men plus 450 marines. The air wing operating on board comprises 16 helicopters, of which six are placed on the flight deck. The Russian Navy plans to deploy eight Ka-52K attack helicopters and eight Ka-29 multi-mission/ASW helicopters on the ship. Agreement on Mistral ships is one of the largest contracts in the history of Russian-French military cooperation. 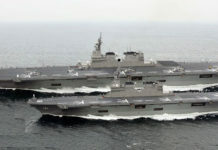 Moscow and Paris signed the EUR 1.2-bln contract for two Mistrals in June 2011. The first crew comprising 177 seamen and 60 instructors is already undergoing training in France. The first stage of training began in February and will continue until the end of May. The second stage will take place from June through October in Saint-Nazaire both onshore and onboard the Vladivostok. Supporting the Russian Pacific Fleet, the two vessels are expected to increase the at-sea to in-port ratio of the Fleet, increasing the average mission endurance of the new vessels. 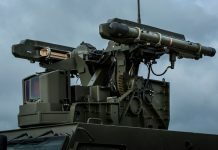 The port facilities for the two ships will be located at an existing naval base on the shore of the Uliss Bay near the Far East city of Vladivostok. Vladivostok under construction at DCNS’ shipyard at St Nazaire. Photo: Christian Plagué.